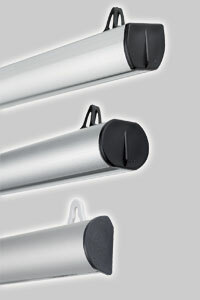 At Digitex we offer a range of attractive professional banner rails for hanging posters and banners. Suitable for single and double sided posters. Range of styles and profiles. Ideal for paper, fabric & PVC prints. Rails include end caps and hanger clips. Rails snap open and snap shut to change posters or allow the posters to easily slide on. Some rails can be wall mounted. Can be cut to a range of sizes.